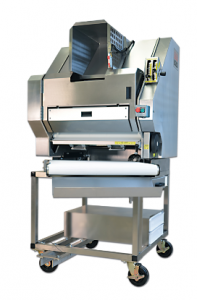 The highly versatile Volumetric Divider is an automatic suction-fed divider suitable for most types of doughand can produce up to 960 pieces per hour. Dough is easily fed into the Volumetric Divider’s hopper whichcan hold up to 70kg and is then sucked through with minimum pressure which prevents any warming ofthe dough. The inside of the hopper is Teflon coated to avoid sticking and aid cleaning. All hoppers arefitted with isolated covers to conform to the strictest safety requirements. The accurately divided doughpieces are automatically fed through an initial dough shaper to produce a tightly formed dough piece,while the integrated flour duster prevents any dough sticking to the conveyor belts. Each built to orderVolumetric Divider is manufactured in stainless steel, guaranteeing them to be durable, hygienic andeasy to clean. 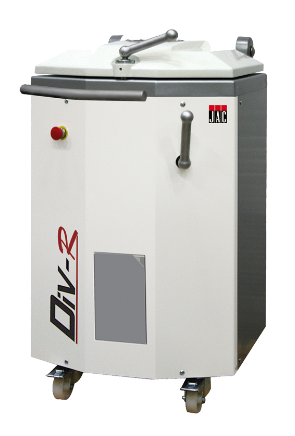 Jac’s Div-R manual hydraulic divider is simple and easy to use and has a product weight range of between 100g to 950g. Dough is simply placed into the top of the shaping vat and the pressurised lid ensures the dough is evenly divided. This highly-versatile machine can divide up to 20 pieces of dough at a time and is available with either a round or square shaping vat. The anti-splatter flour guard reduces flour emissions and collects any excess flour dust.A pressure adjustment lever, housed in the front of the machine, can be simply and easily adjusted to suit a wide range of doughs. Each divider is crafted in stainless steel which guarantees them to be durable, hygienic and easy to clean. The table-top Mini-Moulder provides the perfect solution for small businesses that have limited space but need to produce a wide range of breads up to 6 inches long. 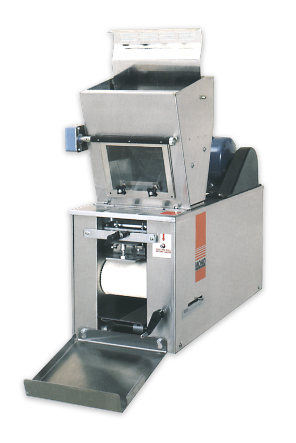 Dough pieces are easily fed into the Mini-Moulder and the dual sheeting rollers give a gentle reduction of the dough while the curling chains provide improved consistency of shape and size, giving a tight mould with no tails. Teflon coatings used in the dough path prevent the dough sticking to the rollers and curling chains. This highly versatile Combination Moulder shapes all oven bottom and tin bread perfectly and will process up to 960 pieces per hour. It consistently produces perfectly shaped products each and every time – including bloomers, tin breads, batons and French sticks. The dough pieces are fed into the Combination Moulder and pass through dual sheeting rollers which give a gentle reduction of the dough. Dough sticking is prevented thanks to the use of Teflon coatings and high performance polymers in the dough path. The user-friendly controls are easily adjustable for different product settings. 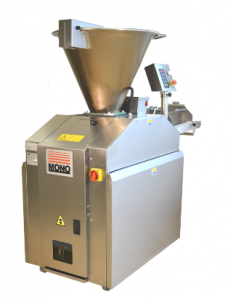 The Combination Moulder also features an ergonomically positioned seeding station, which provides a conveniently placed area for the application of speciality toppings.